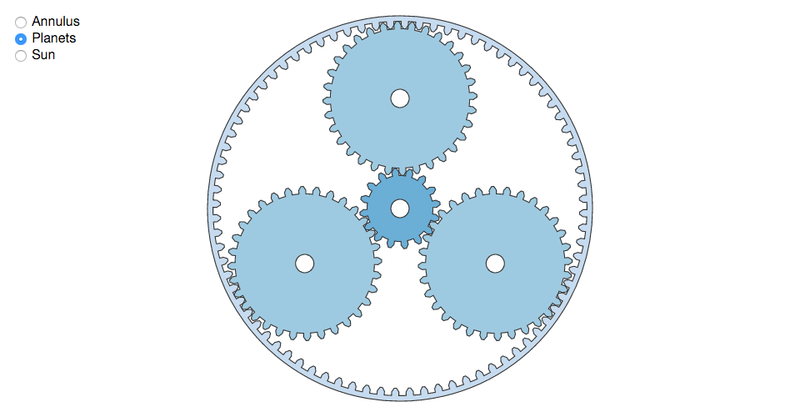 Epicyclic gearing or planetary gearing is a gear system consisting of one or more outer gears, or planet gears, revolving about a central, or sun gear. … Epicyclic gearing systems also incorporate the use of an outer ring gear or annulus, which meshes with the planet gears. Use the menu in the top-left to change the frame of reference, fixing the specified gear in-place. Hello sir i want to perform intersection with two geojson files with draw tool. I have tried with by using example https://bl.ocks.org/pgiraud/2ed05b0a9e394c5652b3. By using it i can able to perform intersection to one geojson with draw tool. Now my intension is to perform intersection to the two geojson files and then find intersection of the one geojson with other geojson, i have tried with the code like below for reference sir. Hi, this question is actually relates to the D3 graph stated here http://bl.ocks.org/mbostock/7607535. I'm very interested in using this graph. However, could you suggest a bit on how to include "hover" behaviour for every node (include parent and children nodes) please? Does anyone has the data called 'airport.csv' and 'flights.csv' because in the example :https://bl.ocks.org/mbostock/7608400 , these two files are used but there is no source, I want to figure out the format of these files and use my own data to replace them.